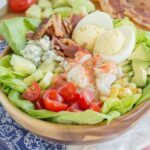 A simple way to add a little flair to the classic Cobb salad recipe with tons of flavor and texture. In a small bowl, combine the yolks from the hard boiled eggs, Greek yogurt, and mustard. Stir until creamy, breaking up yolks with a fork. Season to taste with salt and pepper, and spoon the yolk mixture into the halved egg whites. Store in the refrigerator until needed. Cut lobster tails in half lengthwise and brush each half with 1/2 teaspoon olive oil or 1/2 teaspoon Marzetti® Garlic & Herb Chardonnay Vineyard Dressing. Bake cut side up for about 6-8 minutes or until the internal temperature reaches 145°F. Set aside to cool. Divide the lettuce, cucumbers, tomatoes, corn, avocado, blue cheese, and bacon between four bowls. Remove the lobster from the shells, cut each half of a lobster tail into chunks and top each salad with the meat from half of a lobster tail. Top each salad with two hard boiled egg halves and drizzle with Marzetti® Garlic & Herb Chardonnay Vineyard Dressing.